i realize i haven't posted anything lately so i thought some of you might be interested in seeing some of my work next to its initial sketch.unfortunately i'm in the process of moving and my workplace is a bigger chaos than usual but i've found some sketch for my recent work on the hagakure series.if you look closely you'll see i changed some stuff compared to the lead drawing. 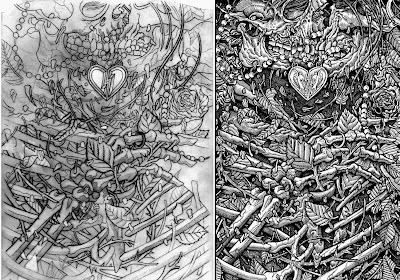 its obvious what medium was used to create the sketch... im curious what tools you use to convert/finalize the piece on the right. I'm curious as well... I'd love to see more 'work in progress' pieces if ya got em. They're a lot of fun to see. hi there!! wow i absolutely love you hagakure III and hagakure mural and unfortunately i missed my chances on buying one at shirts and destroy- any recommendations on where to find these limited amazing prints?? thanks! keep on keepin' on you're really talented!